I have to say, I disagree with your description. Based on size alone, at 14 cm this is much too large to have been for salmon fishing. Stylistically, fish harpoons tend not to have a blade bed, but rather some kind of cylinder formed by the two valves. Flat beds such as this one are more consistent with large arming points made of ground slate or ground mussel shell. If intended for a fish, this would be more suitable for Fraser River sturgeon, say. But I doubt it. I’d suggest in size and manufacture this is much more consistent with a sea mammal harpoon head. I don’t recall seeing any of this size in Coast Salish archaeological sites. If your provenance traces to Laskey and thus to Cook, I’d suggest it is much more likely to be from the Nuu-chah-nulth (Nootka) area of western Vancouver Island, where Cook occupied himself much of the time he spent on the NW Coast proper, and with which it is stylistically consistent. Indeed, even without provenance that is where I would assign it. And I would suggest in size and manufacture it is more likely to be a large sea mammal – probably whale – harpoon head of a kind we describe out here as “Composite Toggling Harpoons”, composed of two valves forming the barbs with an allowance (usually) for an inset arming point. Something like a sea lion harpoon I would expect to be about 2/3 of this size. Further, Cook never really had much interaction with Coast Salish groups. Normally too I would expect the valves on one of this size to be made of antler or of wood (yew, or Douglas fir) and not bone so that is an interesting difference. Anyway, all this is by way of saying, it appears the lanyard extends up one side, then crosses through the notch (blade bed) to the other side where it fastens. I’d be interested in knowing if this is the case since it would be an interesting functional design aspect encouraging the harpoon head to toggle when pressure is put on the lanyard. If you had higher resolution pictures I would love to see them. Composite Toggling Harpoon with lanyard. This harpoon head has one large split point, with a curved split socket with pointed tips. It has twisted sinew lashing around the middle and a line of vegetable fibre attached. 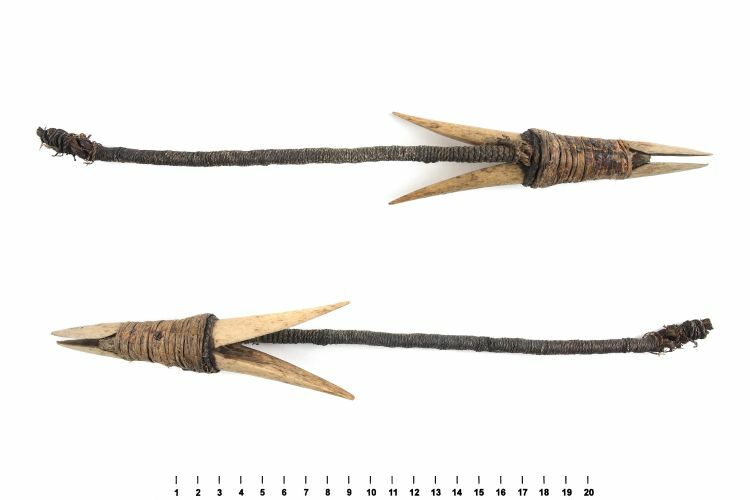 This type of harpoon would have been used to catch salmon and is stylistically attributable to the Salish people of the North West Coast of America. The harpoon was originally accessioned as donated by Dr. G. Turner, however there are no items from the North West Coast on the 1860 donation list. It may be one of the hooks mentioned by Captain John Laskey in his 1813 account of the museum, in which case it may have been collected on one of the three Pacific voyages of Captain James Cook. I have to say, I disagree with the description. Based on size alone, at 14 cm for the head, this is much too large to have been for salmon fishing. Stylistically, fish harpoons tend not to have a blade bed, but rather some kind of groove formed by the two valves which supports a cylindrical bone point. Flat beds such as this one are more consistent with large arming points made of ground slate or ground mussel shell. If intended for a fish, this would be more suitable for Fraser River sturgeon, say. But I doubt it. I’d suggest in size and manufacture this is much more consistent with a sea mammal harpoon head. I don’t recall seeing any of this size in Coast Salish archaeological sites. If the provenance traces to Laskey and thus to Cook, I’d suggest it is much more likely to be from the Nuu-chah-nulth (Nootka) area of western Vancouver Island, where Cook occupied himself much of the time he spent on the NW Coast proper, and with which it is stylistically consistent. Indeed, even without provenance that is where I would assign it. And I would suggest in size and manufacture it is more likely to be a large sea mammal – probably whale – harpoon head of a kind we describe out here as “Composite Toggling Harpoons”, composed of two valves forming the barbs with an allowance (usually) for an inset arming point. Something like a sea lion harpoon I would expect to be about 2/3 of this size. Further, Cook never really had much interaction with Coast Salish groups. These harpoons work by an analogous process to the toggles on a duffel coat: insert the toogle narrow-ways, then it turns side-ways and won’t pull through the loop. For toggle, read “vicious harpoon” and for loop, read “flesh”. Because most maritime hunting and fishing technologies require immobilization of the prey and retrieval, the technology tends to quite a bit more complex and intricate and well-engineered than terrestrial hunting technology which is more single purpose (kill!). The composite harpoons are a great example of this. Normally too I would expect the valves on one of this size to be made of antler or of wood (yew, or Douglas fir) and not land mammal bone so if these valves are land mammal that is an interesting difference. What is that organic matter between the valves? The lanyard? This entry was posted in Archaeology, Northwest Coast, pics, Technology, Uncategorized, Vancouver Island and tagged Archaeology, artifacts, fishing, harpoons, Hunterian Museum, museums, Northwest Coast, sea mammals, whales. Bookmark the permalink. Did the Hunterian ever reply? BTW, I *am* addicted to the “go to a random post” link in the upper right corner. It gets me to all kinds of stuff. Hi — yes they did, a very nice letter with some good photos clearly showing the lanyard attachment. I should ask if I may post them. Yeah, the “addicted” button brings me to stuff I barely remember as well. It’s closing in on 300 posts to the blog and readership grew after a certain point, but this post from October 2, 2009 – well, suffice it to say, there were twice as many views of the website this weekend than there were in the entire month of October, 2009. Some of these older posts might be interesting to folks so it is good to see them brought to the surface via the comments bar as I think I’ve mentioned before.